In the first stage of the DARPA Robotics Challenge, which we reported on here, contestants were asked to demonstrate that they could navigate a virtual robot through a variety of simulated challenges. The winners received the honor of moving to the next round with a real robot provided by DARPA to compete for a spot in the finals. The robot, Atlas, was designed by Boston Dynamics for the challenge based on their Petman robot platform. Versions of the robot have been shown throughout its development, but today DARPA and Boston Dynamics unveiled the version that will actually be used in competition (shown at right). It was also announced today that the next stage of the challenge will take place Dec. 20-21 at Homestead Miami Speedway in Homestead, Fla. An initial description of the tasks the robots will be faced with is available here. In addition, the final group of participants in the challenge, non-funded teams developing their own hardware, are now able to register here. The video below is a compilation of footage tracking Atlas from simulation through various testing and finally to the version that was unveiled today. 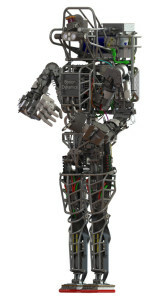 For more on Atlas and the DRC, check out the official DARPA Robotics Challenge website.